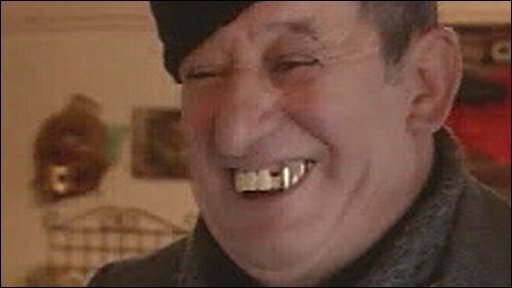 When a TV crew offered to pay to film the residents of a Romanian village, the locals agreed. But they were furious to find themselves ridiculed by the British comedian Sacha Baron Cohen's hit film, Borat, and are determined to win recompense in court. Seventeen-year-old Carmen Ciorebea dreamed of escaping her life in the poor Romanian village of Glod. While her parents wanted her to marry her boyfriend and have children, all she wanted was to leave for Spain, to find wealth and meet new people. Glod, which lies about 85 miles (140km) north-west of the capital, Bucharest, has cable television, yet no running water. Clothes are washed by hand in the stream. There are few job opportunities, least of all for Carmen, whose mother persuaded her to abandon her education to work in the family shop. "It's not easy here. I'm not happy. It doesn't suit me, what is here. It's better to leave and forget everything I don't like here," she lamented. "Thank God I learned Spanish by watching TV. If you learn a lot you can leave this village." Three years ago a film crew came to Glod. They asked the villagers to take part in a film, and - the villagers claim - paid those who did about three euros (£2.50) each. 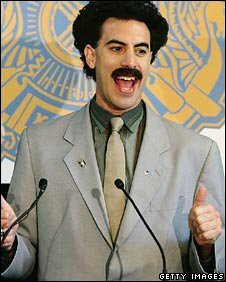 Glod was to become the fictional Kazakh home of Sacha Baron Cohen's character, Borat, in the 2006 film of the same name that went on to take £150m at the box office. In the film, Cohen plays an uncultured journalist who leaves his home in Kazakhstan to travel to the US, where he pursues the actress Pamela Anderson. But the villagers of Glod say they were tricked into appearing in Cohen's film. They claim they were told it was going to be a documentary, but instead have been portrayed as backward people and criminals. This is disputed by the film company, which says most, if not all of the film's subjects knew what the shoot was about. According to Carmen's grandfather Spiridom, the town mechanic: "They portrayed me as a gynaecologist and that I do abortions. "I'm not a doctor. I'm not a gynaecologist and I'm not a criminal. I don't do abortions. That's what bothers me the most. If it was a documentary, as they told us, I wouldn't mind." 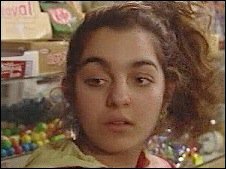 In another scene, Cohen stands alongside a local girl and describes her as the "number four prostitute of the whole of Kazakhstan". The people of Glod were persuaded to try to take on Hollywood by two lawyers, Michael Witti from Germany, and Ed Fagan from the US. The lawyers advised them that they could receive as much as $30m (£18m) in compensation. "They were talking about a documentary, but this is something completely different. This is humiliation and an affront," Mr Witti said. Carmen's father Ion became involved in pursuing the claim against Cohen because if it was successful, he said, he wanted to use the money to invest in infrastructure and set up industry with jobs and pensions that would benefit the villagers. Ion planned to install water pipes so the villagers would no longer have to collect their water from a well, and has ideas of opening a juice company and starting a fruit exporting business. Ion and Spiridom Ciorebea, together with another villager, Nicholae Todorache, travelled to London from Romania where they presented their file at the offices of 20th Century Fox. But the lawsuit was thrown out in April by US district judge Loretta Preska, who said the case would need to make more specific allegations if it was to be successful. A 20th Century Fox representative rebutted the Glod villagers' claims, saying: "Most of the villagers knew they were taking part in a film, not a documentary." But she admitted that "maybe not all people who took part in the film understood what it was all about." 20th Century Fox maintain that all villagers signed release forms and most were paid more than the $4, or 3 euros, recommended by the local film board. There has been no compensation for the villagers of Glod, though their lawyers intend to refile their case. Carmen, meanwhile, has still not escaped to Spain. Instead, she got married and has given birth to a baby girl. Storyville - When Borat Came To Town is on BBC Four on Monday 27 October 2008 at 10pm (2200 GMT).